Three-time Super Bowl champion Troy Aikman has called for a "complete overhaul" of the Dallas Cowboys amid another disappointing season. 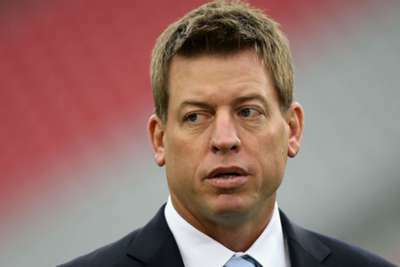 Aikman led the Cowboys to three Lombardi Trophies in 12 seasons with Dallas, and they have not been to the Super Bowl since his last triumph at the end of the 1995 season. And he believes significant changes are need to restore the franchise to its former glory, telling 1310 The Ticket: "Go through the list and this team, over a long period of time, has been what it's been. It hasn't always mattered who the head coach has been. So to me, if you're asking me, I'd say there has to be a complete overhaul of the entire organisation." Aikman took aim at owner and general manager Jerry Jones, who took the reins in 1989 and has been a constant factor during a number of coaching changes. For Aikman, that is a problem. "I've heard Jerry say, 'OK, look, we're going to do it differently. I'm going to do it differently,' ... but it's the same. Nothing changes," Aikman added. "And that to me is the bigger issue beyond, yes, coaching is important, personnel, all those things are important, but how are you going about evaluating how you're going about running the organisation? "Whatever that looks like — and everyone has an opinion on what it does look like, but I'm not in the building. I have no idea. "I talk to people. I talk to people who have been inside the building and have a pretty good understanding how things are run, and in a lot of ways there's a lot of dysfunction and that has to change if this team is going to be able to compete on a consistent basis like the teams that you look to around the league that seemingly are in the hunt each and every year." After Monday's 28-14 loss to the Tennessee Titans, Jones said there was not a scenario where he would make an in-season head coaching change. There has only been one change made to that role in season under Jones' rule, and that was moving on to incumbent Jason Garrett in 2010 after his predecessor Wade Phillips was at the helm for a 1-7 start. The Cowboys are 3-5 and are in third place in the NFC East — only topping the struggling 1-7 New York Giants.